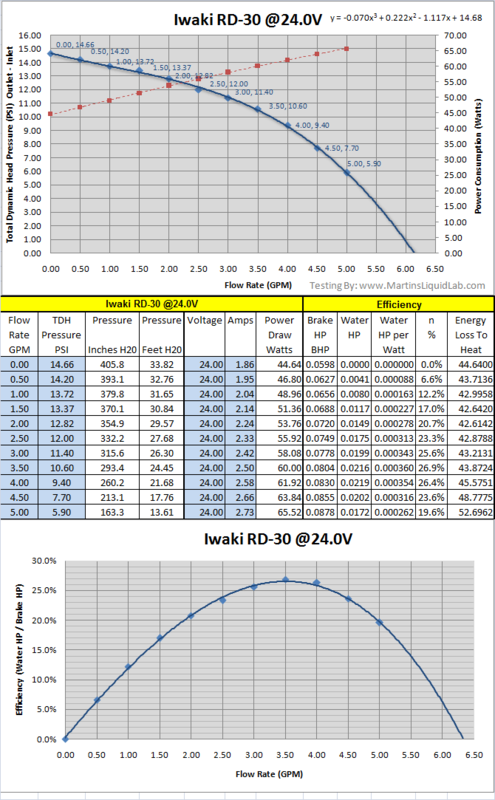 Welcome to my Iwaki RD-30, 24 Volt DC pump review. I would like to give special thanks to NaeKu from xtremesystems.org forums for loaning me his beast of a pump for some testing. Thanks!!! 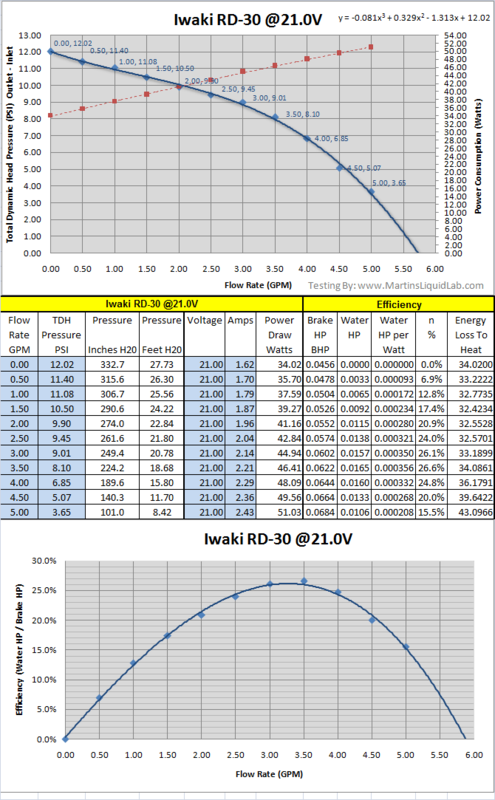 With this review I will focus on the performance characteristics of the Iwaki RD-30, 24V DC pump. The pump I'm looking at on this website page is considered one of the strongest and elite of water-cooling pumps available. Iwaki is known for it's ability to construct long life and high powered pumps and they are generally the strongest of the pumps most people use in water cooling. This pump is DC powered, but it is also rated at 24V. In my testing I had the ability to adjust voltage infinitely with a variable testing power supply, but in a computer you'll need to purchase a secondary power supply if you want to get the really power out of it with anything other than 12V from the computer PSU. The pump does still perform well at 12V, so if you needed to wait on the extra PSU, you can get near DDC 3.2 performance at 12V while you acquire a dedicated meanwell or other PSU. The pump employs a very larger impeller which provides the pumping power. Volute is a simple circular design with a small approximately 6mm outlet port that transitions quickly to the large 5/8" style barb outlet. I believe the inlet is close to a 3/4" size and outlet port a 5/8" size so be prepared to due some tubing stretching to get tubing on. I did so with Master-kleer 7/16" ID x 5/8" OD tubing for my test runs. 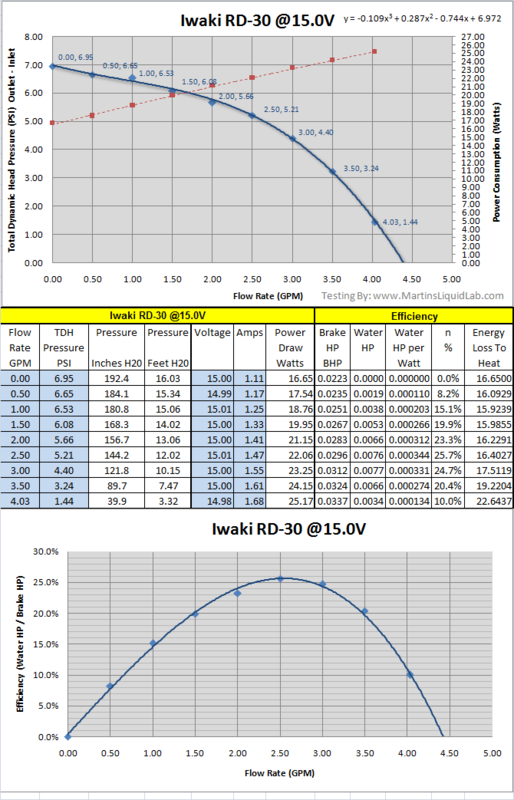 If you want more Iwaki RD-30 specifications and details check out Iwaki's RD Series website. The most scientific way to determine a pumps performance is to plot the entire pump pressure vs flow rate curve. This can be done by measuring pressure at the outlet of the pump with a digital manometer and using a gate valve immediately after this pressure measurement point. Then utilizing this gate valve, adjusting the amount of restriction will net different flow rates and coinciding pressures the pump is producing over its curve. All of this is preferably done at a very precise 12.00V or the tested voltage as needed. While testing for pressure and flow rates, data was also collected using multi-meters to capture voltage and current in amps for power consumption data. I've also since learned and adjusted my method of pressure testing to capture "Totat Dynamic Head" in pressure (PSI) format. Previously my testing only captured "Dynamic Discharge Head" which is pressure on the outlet line only. The inlet line is the suction line and some suction occurs as flow rates increase due to pressure drop in the suction line feeding the pump. 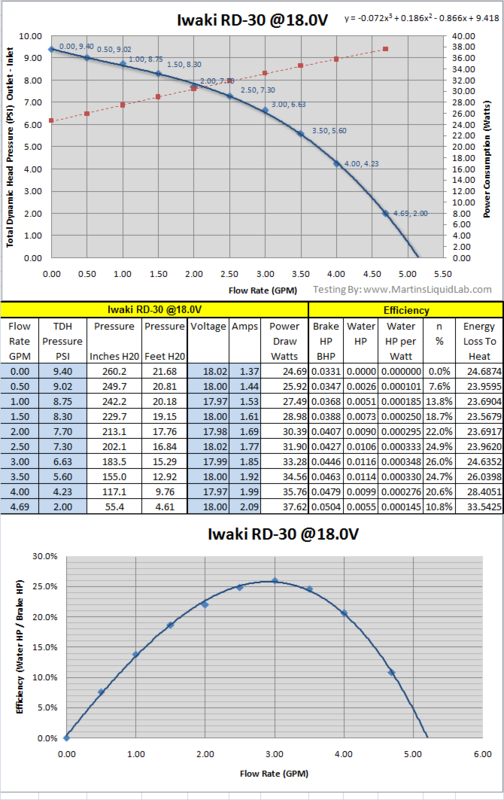 This new method is consistent with the recommendations by gouldspumps.com pump field testing technical article for field testing and I believe more accurately captures the entire power provided by a pump and will provide more accurate curves for estimating flow rates. You'll see the pressure axis for this new testing method is labeled as "Total Dynamic Head Pressure which is equal to the "Discharge Pressure" - "Suction Pressure". You can think of this as the reverse of pressure drop, it is "Pressure Gain" from the pump. I believe most manufacturer pump curves follow this same testing method for developing pressure. It's actually more common to refer to "Head" rather than pressure, but in water cooling we're always dealing with water, so I've had the habit of just reading in PSI and leaving it at that, so it's consistent in units with pressure drop in PSI. I'll be working my way back through my previous pump testing to update the curves so the flow rate estimator is more accurate. First up 12.0Volts performs just under what a DDC 3.2 with top will do, still admirably well. I actually found I could start the pump with as little as 6.7V, so it's very capable of under-volting. 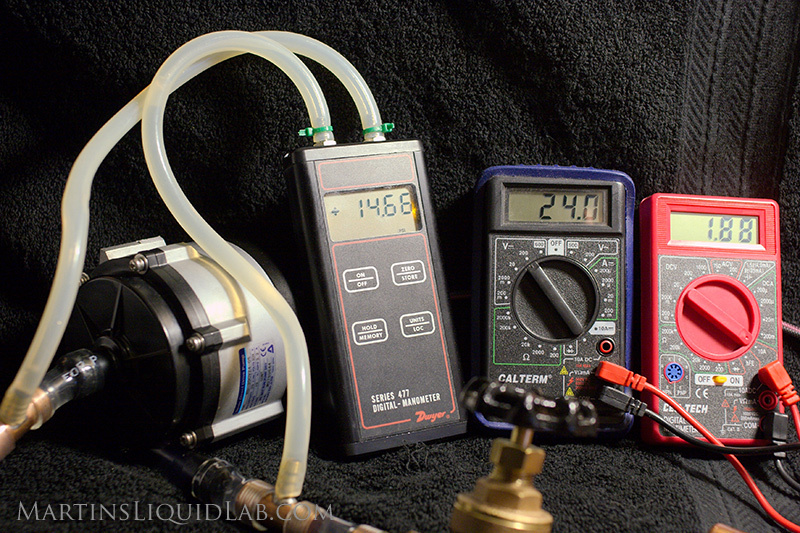 Pressure at 1.5GPM is now running at about 4 PSI, this is slightly lower than a single DDC 3.2 at 12V. The efficiency curve peaks around 2.1 GPM and power consumption is a low 12 watts at 1.5 GPM, nice!. Next up is 15.0V, this performs better than any of the DDC 3.2 with top combinations. Pressure at 1.5GPM is now running at about 6 PSI (great! ), also more powerful than a DDC 3.2 at 12V. Efficiency now peaks around 2.6 GPM, and power consumption is still a respectable 20 watts or so at 1.5 GPM. This would probably be a good setting for average systems that are not extremely restrictive. Next is 18.0V, about the most common place these things are run. Pressure at 1.5GPM now running at about 8 PSI, which is great where you need some extra power for a more restrictive system. Efficiency now peaks at around 3.0 GPM and power consumption is climbing to about 29 watts at 1.5GPM which is starting to add up in heat. Next is the 21.0V. Pressure at 1.5GPM now running at about 10 PSI, which is getting way up there and similar to dual DDCs in series. Efficiency now peaks around 3.25 GPM, which is a bit higher that you'll see in water cooling for most cases. This means the pump just isn't operating at it's most efficient point. As a result of slipping down the efficiency curve power consumption climbs to 40 watts at 1.5GPM. This setting may still prove to me a good spot for extremely restrictive highly nozzled blocks on systems with large radiators. I also happened to already peg my 5 GPM flow meter in this test...whoohoo! And last but not least the rated 24V point. Almost 14 PSI at 1.5GPM!!...wow. This even puts dual DDC's in series looking in envy. Unfortunately efficiency is now peaking clear over at 3.5GPM and power consumption has begin to really climb at nearly 51 watts for a 1.5GPM range. But at these powerful pressures it's likely you'd see 2.0GPM or better which is 54+ watts of power consumption. I would only reserve this setting as experimental; it's really a lot more power than you could use. That's alot of power, but also a considerable amount of heat dump. On a tripler radiator it can mean as much as a 2C water temperature rise. You'd have to be running multiple radiators and highly restrictive blocks to really take advantage of this. And the following is a simple recording of that test. Late at night when the house is very quiet, I recorded the sound with my JVC GZ-MC500U mini video camera which has stereo recording capability. Then converted in windows movie maker to VHS quality and uploaded to YouTube. It's still kind of hard to get a sense of loudness from the recording, but it does present you with a good indication of the type and tone of sound. Subjectively, the pump is much quieter than I expected, just a slight medium pitched whine that doesn't really become apparent until 21v and above. It is a big pump though so I can only expect vibrations would quickly be the primary culprit as with any pump in noise related issues. As with any pump I would suggest a very isolated on a soft pad like Petra's Gel Stuff to isolate pump vibrations. NaeKu mentioned the pump likes to walk around with vibrations so you'll probably have to strap it down loosely somehow. I didn't notice that on my test bench, but it is a big solid pump so any vibration will have some energy behind it. Overall I was pleasantly surprised by the smooth operation and sound level. I expected the size and power of the pump would relate to much more noise. I really don't consider the pump that much louder than a lot of pump I've tested and probably more quiet than the Alphacool AP1510. While the pump internals are without concern, I must note that the aluminum feet that are cast into the bottom of the pump housing are extremely fragile and easily broken. During shipment of this pump to my house for testing even when wrapped in a dozen or more layers of bubble wrap, one of the aluminum feet broke. I could not see any apparent abuse on the box package and the bubble wrapping almost seemed excessive as I could tell NaeKu really cares about this pump. The exterior of the pump is cast aluminum, and like any cast metal, casting generally lowers the tensile strength and increases how brittle metal is. The footing bolt flanges don't have any sort of webbing support to provide rigidity, so the can and have now shown that failure of the cast aluminum metal is possible. I would be extremely cautious of the metal footings and ship the pump only on it's side in solid pieces of foam or other to protect the feet from damage. Watch out for those aluminum mounts, they break easily!! 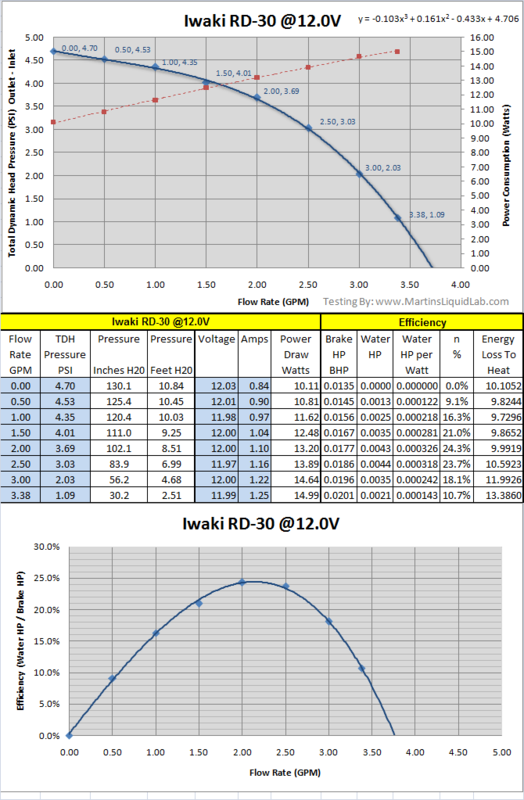 The Iwaki RD-30 is the beast of a pump, it is more than powerful enough for any water-cooling application!